Chords in square brackets (e.g. : [Am]) get turned into ukulele chord diagrams above the lyrics. Download UkePDF software here. You must have a computer capable of running Java. On most computers (Windows 8+ & Mac 10+), double-clicking the JAR file will run the program. Enter some lyrics in the top pane (this is the source file). 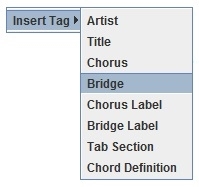 Add chords in square brackets (like [C]) right before the place where the chord changes. Hit the "Refresh PDF" button to view the output in the bottom pane. You can download this sample input file (Folsom Prison Blues), and then hit the "Open Source File" button to load it. Hit "Refresh PDF" to see the output in the bottom pane. These two lines will be indented by half an inch (72 points = 1 inch). It will have a label above it that says "Chorus:". Then you can use the new chord [C2]. "C" is the chord label, and the numbers are the g-, c-, e-, and a- string fret numbers. Use a fret number of -1 to put an X in the chord diagram. Pressing <Ctrl> + Enter will quickly refresh the PDF view (this is the same as hitting the "Refresh PDF" button). Pressing <Ctrl> + d will delete a line of input. Drag and drop selected text to move it easily within the input pane. Hold <Ctrl> while dragging & dropping to copy the selected text. Use the "Save PDF" buttons to save a PDF that you can share with the world. Use the "Save Source File" buttons to save the content in the top pane (so you can change it later). Change the window width to change the output view zoom. Drag the pane separator to give more or less room to the output view.